I got lost once on my way to buying a beer at a lonely bar. There’s a good story coming so don’t blink, look away or try to multi-task…or you’ll miss it. Being lost can mean many things to many people. When you wake up one morning and remember that your life partner has been dead for a year and five months, you can be slam-dunked with the “I’m lost” feeling. Yes, there are many ways to get lost, be lost, stay lost or just lose your moral compass and find yourself…well, lost. Admittedly, it’s a little harder to get lost these days than it was twenty years ago. Part with a few hundred dollars and you’re hard pressed to make an excuse for getting lost. With satellites, EZ passes, security monitors and personal Facebook data, few people in our part of the world can really get physically lost anymore. Your location is known by tens of thousands of people. But, if it ever happens…your entire sense of the world can change in three seconds. It can be extremely disconcerting to your spatial orientation to be in a situation where the only direction you are sure of is down…because all you can see are the boots on your feet. I was lost once. It was back in the pre-technological age of 1977 when a $3.95 plastic compass was all you needed to tell where north was. I didn’t even have that. The memory of that afternoon will never leave me. I can still close my eyes and feel the tangible world around me being lost amid the swirls of a snowfall so dense and intense that anything two feet in front of me was a blast of wind-driven snow. “When I get off the lift at the top, I’ll have to get down.” That was my rational. Some people call it an accident waiting to happen, but I called it a cheap way to learn how to ski. I became a fair skier and can say, honestly, that I never took a bad fall and never broke any part of my body that I would need on Monday morning. My next task was to become a competent nordic skier. That was not as easy as it sounds. In those years, the only people who cross-country skied were Swedes, Norwegians and a few Finnish with a dozen Laplanders thrown in. I was Irish. I knew my wool and my ale, but I did not know the proper way to be good at this sport. At the time, I lived in a remote farm-house. There were plenty of fields to practice but there was the problem of barbed-wire and stone walls that surrounded the pastures and open spaces. I tried a few golf courses, but the snowmobilers quickly took those spaces for themselves. But, not all was lost. I lived a few miles from a lake. They are flat and most of the time have thick ice layers. With the exception of a few people who, for reasons I could never understand, would drill holes in the ice and stand or sit for hours in temperatures of 4 F to catch a fish, I had the lake to myself. Luckily, there weren’t too many of these types around. It was a Sunday afternoon in January and I felt like having a beer. Now, most normal people would drive a car to the bar and go inside to sit and drink. I decided to ski across the lake and have a beer after I stuck my skis in a snow mound beside the front door. I parked the car directly across the lake from the bar in question. About a mile and a half separated me and my car from the beer I was hoping for. I took my gear down to the lake’s edge, snapped on my skis and took off with the distant bar in full sight. The western sky quickly turned dark, like the clouds had been waiting for me to get about halfway across the ice. The actual skiing was great. Smooth wind packed snow with an occasional patch of black ice. It was on the open and totally slick ice that I had nothing to edge into so my skis began behaving like skates. I was doing figure 8’s. I even did a figure 3 but I had no idea how that happened. I decided to take off the skis and walk across the large glassy ice floes. The clouds were moving closer and getting darker. The snow squall began without warning and became so intense that I lost all reference points, except, as mentioned above, my boots. I didn’t have goggles but I had black horn-rim glasses. These quickly became covered with an inch of sleet-like snow. I couldn’t see…and even if I could, there was nothing to see. I turned around twice which succeeded in only disorienting me totally. 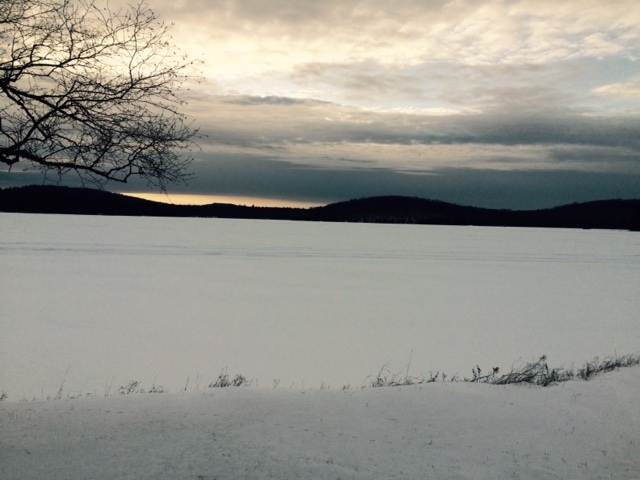 I was lost in a snowstorm on a lake in the wilds of northeastern Pennsylvania. I didn’t know what to do, so I just sat down and laid the skis across my knees. This is how they’ll find me in three weeks when the storm lets up, I thought. Or, maybe the spring melt would come and I would sink to the bottom, baffling SCUBA divers for years to come. I might even become a legend as a result. Or at least a folk song that the country & western band would play at the very bar where I was attempting to get my beer. The squall ended as quickly as it began. I could see the lights of the bar (it was dark now). I continued on my way. 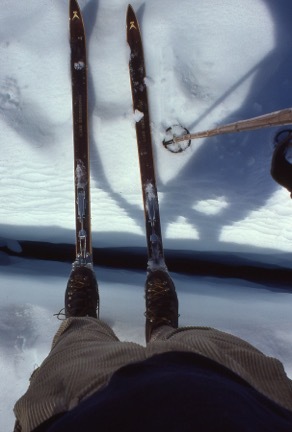 As I expected to do, I stuck my skis and poles into a snow bank by the front door, went in and ordered a beer. I even had two. But I asked for a ride back across the lake to my car. Skiing and drinking can be a lethal combination.